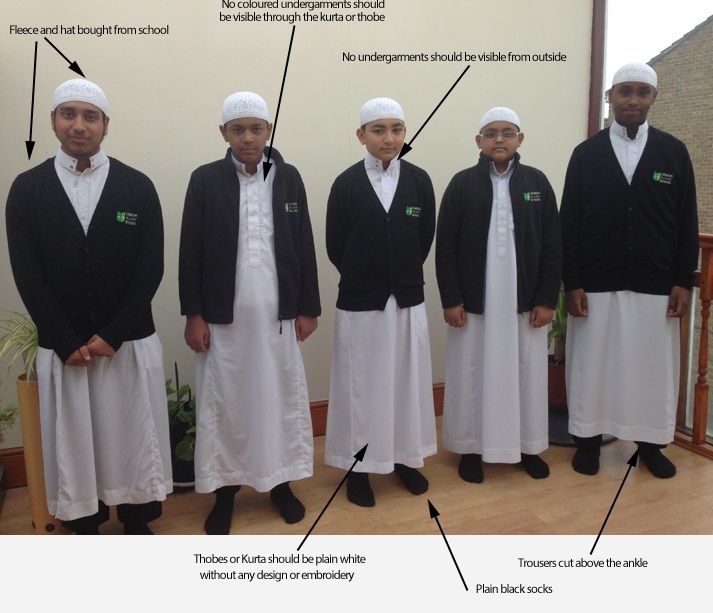 London Islamic School strives to promote a sense of self-respect, ownership and identity through its uniform. Allows students to feel proud and not ashamed to wear cultural clothing of the time of Rasulullah (SAW) in a western society. By wearing the same clothes it allows students to feel they are equal no matter what nationality, colour or background they are from. Allows students to feel that they are proud of being a part of the school. School uniform enhances this feeling of belonging. School uniform prevents the inevitable loss of self-esteem caused to individual students should a family not be able or willing to provide the newest, most expensive or most fashionable clothing and equipment. Plain long white Thobe with round neck collar (No embroidery which is usually around the button section, No Hood) the length being between just above the ankles and half way up the shin. Plain white phanjabi/Kurta with round neck collar, TOP ONLY (No embroidery which is usually around the button section, No Hood) the length being a minimum of 5 inches below the bottom of the knee NOT above). Please note the purchase of the hat, fleece / cardigan is mandatory (MUST) NO students will be allowed to wear jackets or non uniform jumpers in school regardless of weather conditions. On health and safety grounds we do not allow children to wear jewellery in our school. There is no exception to this rule. Prefects will wear a black hat with the same design as the white school uniform hat in order to distinguish them as school Prefects. The school does not permit children to have ‘extreme’ haircuts that do not conform to the rules of Islam or could serve as a distraction to other children. Hair should be cut in one length only. We ask teachers to support the school uniform policy by ensuring students are all in uniform. We ask all parents who send their children to our school to support the school uniform policy. It is the responsibility of parents to ensure that their child has the correct uniform and that it is clean and in good repair.